August 16, 2018 marks the 70th anniversary of Vancouver’s trolleybus network. Today marks the 70th anniversary of Vancouver’s trolleybus network! The electric trolleybuses first burst onto the scene as part of the ambitious “rails-to-rubber” conversion to decommission the streetcar network. The first trolleybus, a Canadian Car Brill T-44, hit the roads on August 16, 1948, forever changing the way we move around in the city. Have you checked out the new items in the TransLink Store? We’ve released a commemorative shirt, recognizing the 70th anniversary of Vancouver’s trolleybus network! Available in men and ladies sizes. Did you know there’s a time capsule at New Westminster Station? New Westminster Mayor Tom Baker look on. Our Transit History section just scratches the surface of what we have in The Buzzer archives, which includes eight issues of the Vancouver Regional Rapid Transit Project Quarterly. The 12-page Winter 1986 edition, released a month after SkyTrain’s opening, contained a myriad of photos and stories touting the launch of Vancouver’s first rapid transit system. Perhaps, the most interesting tidbit is the existence of a time capsule. Mhmm, that’s right! A stainless steel time capsule, sealed by then-B.C. premier Bill Bennett, was buried at New Westminster Station. It will be opened in 2085—a hundred years after SkyTrain opened. Luckily, we won’t have to wait until 2085 to find out what’s inside! 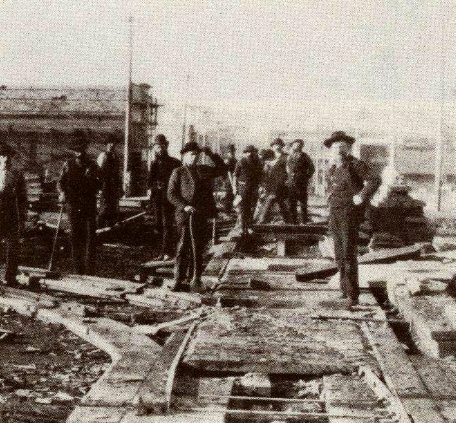 [The inauguration of SkyTrain is] a milestone as important as the arrival in 1885 of the first transcontinental passenger train in British Columbia. The documents which accompany this letter in the time capsule are the essential records relating to the design and construction of SkyTrain and represent the creative efforts of thousands of British Columbian and Canadian architects, engineers, construction workers, planners-and designers. Together, we have shown the world what imagination and determination can achieve. …the opening day commemorative editions of the Vancouver Sun and Province, which contained special SkyTrain supplements, a copy of the rapid transit film, Going to Town, a filmed message from Grace M. McCarthy, minister responsible for the project, one of the invitations to the SkyTrain opening ceremonies, and a copy of each of the seven quarterly reports of the Rapid Transit Project. Also, luckily, we have a copy of Going to Town uploaded to our YouTube account! Watch it here. SkyTrain bursts through a banner on its very first day in service: Dec 11, 1985! Thirty-two years ago today, Premier Bill Bennett proudly announced the opening of SkyTrain, forever changing the face of transit for Metro Vancouver! Rides were free for the first eight days while SkyTrain staff worked out any glitches on the system. According to the Vancouver Sun newspaper, on opening day there were “bands, balloons, political speeches and a crowd of admiring fans” as vehicle 049 smashed through “five colourful banners stretched across the tracks and glided to a halt at Waterfront Station” (“Bands, Balloons, Fans and Glitter,” Vancouver Sun, Final Edition, Wednesday, December 11, 1985). Nearly a month later, SkyTrain would mark its official launch with the start of regular service on January 3rd, 1986. Today marks the 62nd year since the last streetcar ride in Vancouver! We’re definitely a bus region nowadays whether they be conventional diesel, hybrids or trolleybuses, but it wasn’t always that way. Metro Vancouver used to have interurban rail and urban streetcars connecting and moving the Lower Mainland until April 24, 1955 when we said goodbye to Vancouver streetcars with a fitting send-off at the PNE. To know where you are, is to know where you’ve been. So, let’s take a quick look at the major milestones that transitioned our region from rails to rubber! 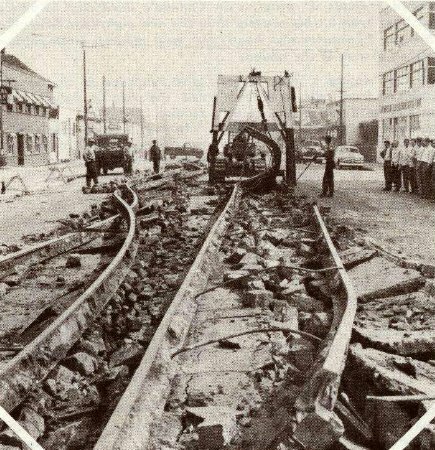 Constructing streetcar tracks on Powell St.
1. Down Westminster Avenue (now Main St) from 1st Ave to Powell. 2. 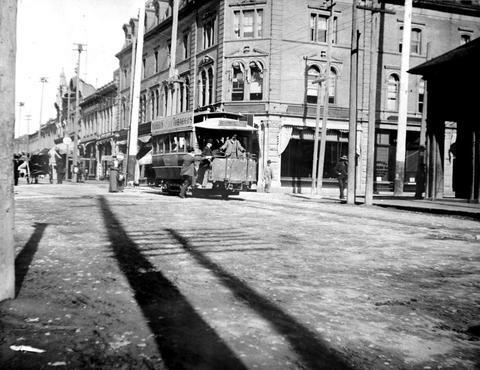 Along Powell and Cordova from Campbell Ave to Granville St.
1922 – Rebuilding of doors on streetcars when the rule-of-the-road switch from left to right. 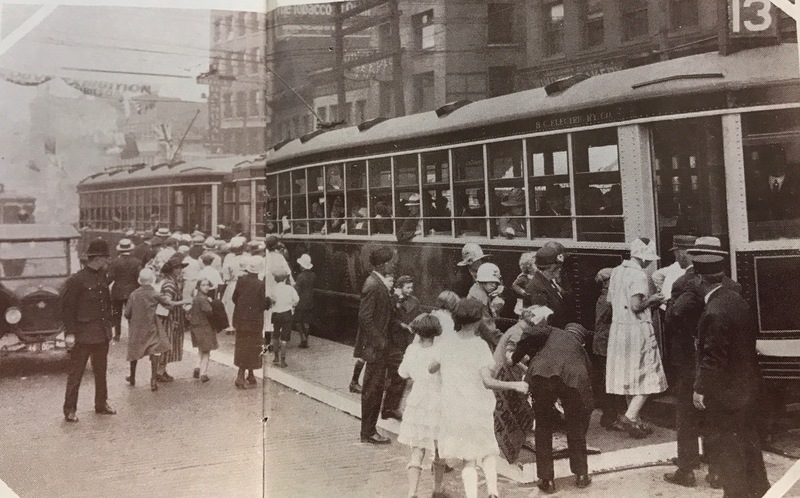 Although the vehicles have changed, the impact of public transit and transportation continue to mould our present and future! Thanks for coming along for the ride down the tracks of our transit history. Have a hankering to see a streetcar today? Just head to the Old Spaghetti Factory in Gastown to see the No. 53 or cruise by East Broadway at the Kingsway and….. tada a lovely little streetcar replica! 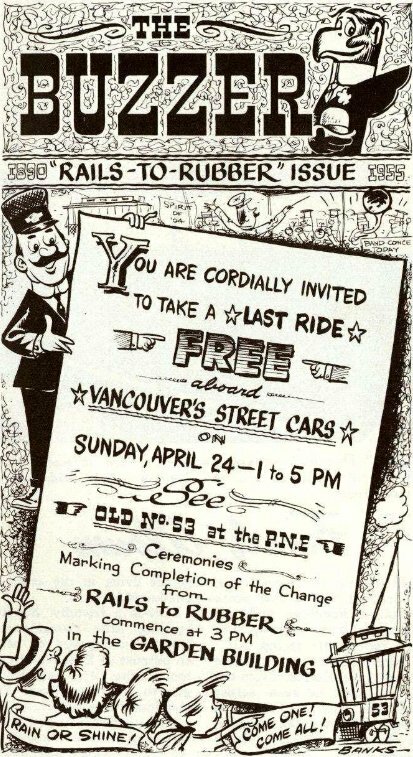 You can also view the special Rails to Rubber 1955 edition of the Buzzer and read more about our streetcar past here. 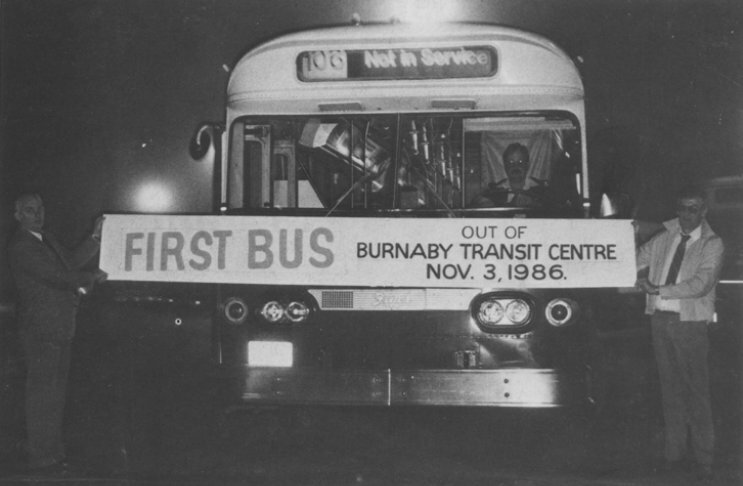 On November 3, 1986 at 4:35 a.m. bus #5101 was the very first to pass through the gates of the brand new Burnaby Transit Centre. Who knew that 30 years later, BTC would still be such a hub for our bus fleet?! This transit centre is made up of a north and south campus and holds fleet overhaul as well as the paint and fabric services for all of CMBC’s buses plus the sign, fare box and bus stop maintenance shops. Some notable bus routes coming out of BTC are the ever-popular 99 B-line, 43 Joyce/UBC, 135 SFU/Burrard Station and 236 Grouse Mountain/Lonsdale Quay – just to name a few! BTC is a highlight for I Love Transit week each year as transit ‘campers’ get to explore buses behind the scenes. To BTC, we wish you a happy 30th birthday and thank all of hard working employees that keep it running and in turn, keep our buses running and serving the transit network! Constable Walker who, at 34 years of age, is the same age as Charles Painter at the time of his death, standing near the location of the shooting. Transit Police as an organization is relatively new. Policing the transit network, however, dates back to the turn of the 20th century. There have been thousands of men and women who have protected and supported the riders of transit and this is the story of one named Charles Painter. Special Constable Charles Painter, officer with the British Columbia Electric Railway Company, who was shot and killed in the line of duty in 1915. One hundred and one years after this tragic event, Painter was recently added to the Honour Roll of the British Columbia Law Enforcement Memorial in Stanley Park. Read on about this interesting piece of transit and transit police history! In the early hours of Friday, March 19, 1915, while on duty in the area of the railway tracks at 6th Avenue and Willow Street, Vancouver, Special Constable Charles Painter spotted a man carrying a bundle of wire he believed to be stolen. While handcuffing the suspect following his arrest, a struggle took place during which the suspect grabbed Special Constable Painter’s revolver and shot him in the abdomen. The suspect ran from the area leaving the officer gravely wounded. Special Constable Painter died several days later after providing a statement to police. Media reports at that time connected a man, later brought to trial in Seattle for a double murder, to the Vancouver shooting, but charges were never laid. Charles Painter was born in Ireland in 1881 and had served in the British Army before coming to Vancouver. He was single and had no known family at the time of his death so was laid to rest in an unmarked grave in Mountain View Cemetery in Vancouver. 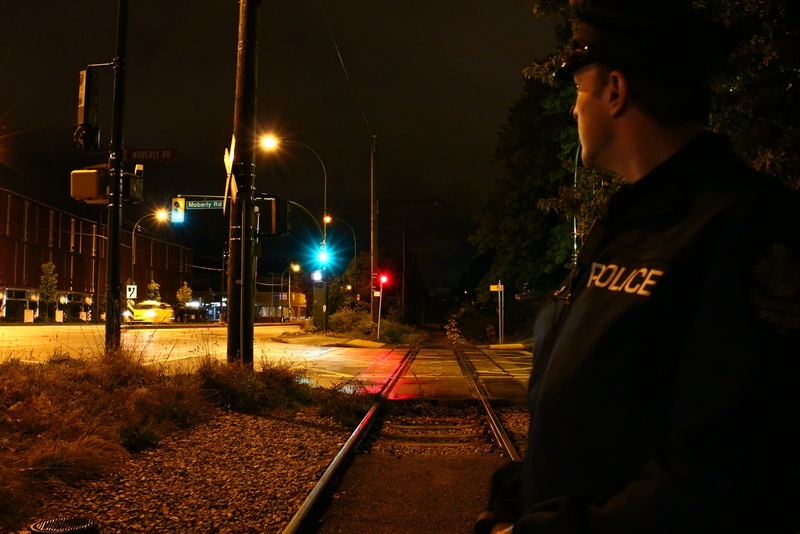 Constable Graham Walker of the Metro Vancouver Transit Police was curious about the history of transit policing in British Columbia and while conducting research, uncovered the murder of Special Constable Painter. Further research showed that his death was not recorded on the BC Law Enforcement Memorial Honour Roll although he qualified for inclusion. 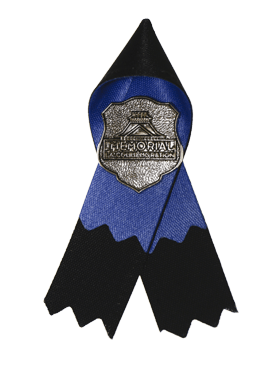 Discussions are underway with the Metro Vancouver Transit Police union to fund the engraving of a suitable headstone for Special Constable Painter’s grave. 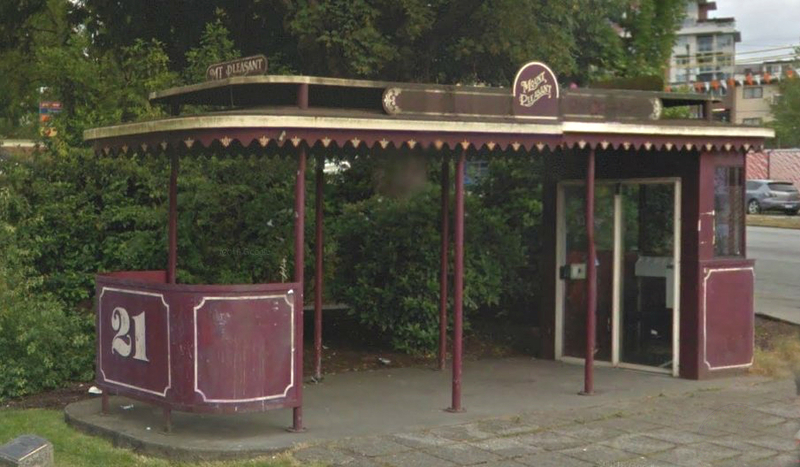 While Metro Vancouver Transit Police may be only just over a decade old, it can trace its roots back to the turn of the 20th century. Research has unearthed a great deal of information about how policing of the hydro lines and transit in those early days of the last century evolved into our modern day police service. Thanks to Constable Walker and his research, we are learning more about the evolution of the transit police organization. The British Columbia Law Enforcement Memorial was held on September 25, 2016 at Brockton Oval in Stanley Park. We honour Special Constable Painter and all of the law enforcement officers who keep us safe on and around transit and in our communities. If you follow the blog, you’ve met Angus before and TRAMS is old hat – but oh, so awesome! However, if this is your first foray into the transit enthusiast world, you might be unaware that old transit vehicles are HUGE for fans here in Metro Vancouver, across Canada and the world! Angus recently sent us some great pictures (captioned by the man, himself) of an old streetcar, refurbished and being used in service on Sundays all this summer in Toronto. He rode this streetcar as a part of a chartered tour and shared some shots from his ride PLUS some way-back-play-back pictures of transit vehicles in 1970s Toronto. New loop at Distillery District. Route 514, a branch of the King Streetcar..
First CLRV, Swiss built 4000, was just ahead of us exiting Neville Park Loop. 1974 – Queen at Bay, City Hall. 1974 – Bay at Albert St.
1974 – St. Clair at Keele. Thanks for thinking of us on your travels, Angus! Do you have some interesting transit photos from around Canada and beyond? Email us with your photos – we’d love to share them on our social channels! 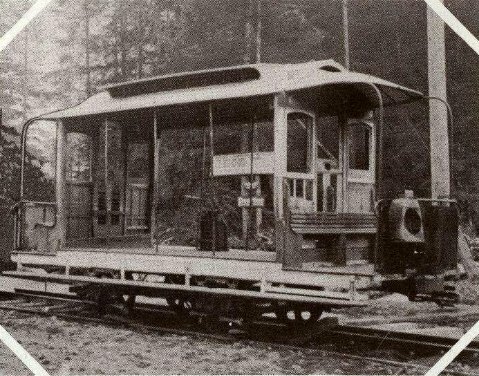 February 22, 1890 – the beginning of transit in B.C. This is such an important date for the province because this day in history marks the launch of public transit in British Columbia! 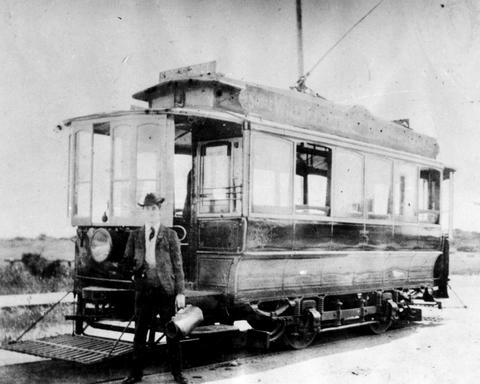 It all started in Victoria with four small electric streetcars, two routes and nine kilometres of track laid down the centre of the city by The National Electric Tramway and Light Company. This was only the third electric streetcar system in Canada at the time. Vancouver wasn’t far behind! Four months later on June 26th, the first car went for a ride all the way down Main St. and on June 28th, the whole 9.6 kilometre system was in service. 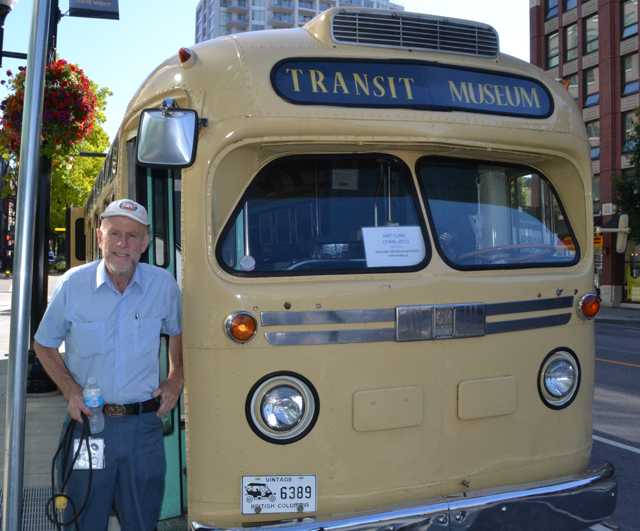 We celebrated the region’s 125 years of transit milestone this past summer! The next major transit launch was in New Westminster a year later with interurban trams connecting to downtown Vancouver through Burnaby which created easy travel for residents of different cities to explore the region. These first benchmarks in B.C.’s transit history began over a century of transit expansion in the province. It is so valuable to know where we’ve come from to see where transit can go in the future! We salute those early transit pioneers that paved the way (sometimes literally) for BC Transit and TransLink to be here today and provide transit service to British Columbia! You can learn lots more about transit history by visiting the BC Archives. A Brill trolley with the BC Hydro colours, operating as the 14 Hastings in 1967. Repost: Written by Jhenifer Pabillano and originally published April 7, 2011. During our April 2011 service changes, we brought back the 14 Hastings trolley route—an iconic former bus route that ran through Vancouver’s downtown for many years! The 14—which even had a famous play named after it—makes its triumphant return to the streets due to optimization changes for the 10 and 17 trolley routes. Here to tell us more about the 14’s history and its current incarnation is Peter Klitz, one of TransLink’s planners involved in the project. Read on for more insights and some classic photos of the 14 through time!